Roll call 7 February: Same, with Tim Bray as well. The TAG resolved to thank The Institute for Software Research at the U. of California, Irvine, and Day Software for hosting this meeting. Next meeting: 17 February. Norm Walsh will Chair; IJ will work with NW on agenda for 17 and 24 Feb meetings. Action PC: Talk to meeting planners about this schedule (noting that it overlaps with W3C track so there may be absences). Action IJ: Talk to Nov AC meeting planners to see if 14-15 ok for TAG meeting. Completed action IJ 2003/01/27: For xmlProfiles-29, send NW's proposal after edits to XML Activity Lead, cc www-tag. (Done). Completed action DO 2003/01/27: Raise new issue about xml:id (separate from xmlProfiles-29). Done. Completed TB 2003/01/27: Develop CP11 more. (Done). The TAG discussed the volume of mail on www-tag and agreed that it needs to managed discussion more effectively. The TAG focused on ensuring that subscribers are aware of the mailing list policy (see related tips for getting the TAG's attention). TBL: Need to remind people more often what list policy is. PC: We need to manage discussion more. DC: Whoever owns an issue should manage discussion; if we don't have an owner for an issue, that is info. If someone says "change x to y" in the arch doc, I'd like to see response from the editor straight away. We will get higher quality comments on the doc if we encourage comments and respond appropriately to them. CL: I'd rather comments be sent to www-tag. Monthly reminder to people how to use www-tag. DC: Comments that are not about an issue and not about the arch doc are out of order. I need owners of issues to, say, moderate discussion. Action SW: Send draft mailing list policy to tag@w3.org. Please refer to issue number in subject line. Please indicate whether you are raising a new issue; TAG does not guarantee will be taken up. Please send text for the arch doc. PC: Need to give feedback to the list to make sure discussion goes in a direction that is useful to us. PC: When new issues are brought up, need to do a better job of getting on agenda, and closing thread quickly if we are not interested. DC: Not responding is better. if the threads get out of control, I expect the Chair to do something. IJ: Start mailing list policy by looking at what's already on home page; then we'll just update that; then send out monthly reminder. SW: I'd like to have a single action item list. DC: Infoworld article on top technologies referred to GET in Web Services. I am pleased that somebody noticed this. PC: We have a goal of going to last call (arch doc) mid-year (per 6 Jan 2003 minutes). DC: I'd rather revisit that at the end of the meeting. PC: Our ftf meeting schedule should take our milestones into account (e.g., we close document at summer meeting). PC: DO, PC think the TAG session should be technical. However, JD thinks we will be bombarded with process-like questions. PC: Others on planning committee suggested walk-through of arch doc. DO: I pushed back on discussing xlink issue. TBL: I'd like to get WGs involved in the discussion, where they have real-life issues. I'd like to connect with people in WGs: E.g, for namespace doc, show three slides of pros and cons, then ask for comments. DO: I'd like to have pros/cons for each one. DC: 29/32 are pretty close. DC: How about a protocol issue? PC: Steve Zilles has agreed to moderate the session. PC: I'd like to know, by the end of this meeting, who will lead discussion of each part of the presentation. Three issues, overview of arch doc, relationship of TAG to community. DC: Walk-through of arch doc. TBL: Role of the TAG (10 mins). Action PC: Report this plan to the tech plenary planning committee. The TAG walked through its Issues list, updating issue "owners" and reviewing pending actions. rdfmsQnameUriMapping-6 : Algorithm for creating a URI from a QName? DC: The XML Schema WG released a requirements doc for XML Scheme 1.1. They have accepted as a "desideratum" (not a requirement) to make URI names for schema components. That's not acceptable to me. We need more than that. SW: Will these be HTTP URIs? See 2.5.1.1 First class objects (RQ-23): "Define an algorithm for generating a URI for any construct in a schema (or, possibly, in a schema document), thus making schema constructs first-class objects in the Web. Minimally the algorithm should cover element( type)s, attributes, simple types, complex types, and notations. Optionally it may also cover other constructs such as named groups and items in enumerations of legal values." SW: Who owns issue 6? TB indicated, but last issue was for DC. DC: I'm willing to take this up, and that we contact the Schema WG and tell them that the desideratum is insufficient. RF: Is it really the Schema WG's job? Or more general? TBL: What the Schema WG does has an impact on a lot of users (of schemas). DO: This is starting to come up in Web Services. PC: See "XML Schema: Component Designators", which I think speaks to RQ-23. We should look at current status of "XML Schema: Component Designators" as well as requirements doc. DO: WG had, I think, forgotten the part about mapping from (WSDL) "parts" to URIs. I reminded them. This is now part of their requirements (see WSDL requirement 128 in CVS version of requirements document 22 Jan 2003 draft). DC: When I last looked at WSDL, I thought that when you did binding, you could map to GET. But seems most useful, when person is making interface, that they could state a preference for GET. I have seen failure modes when people think at the wrong moment of the design process. It would be useful for me if DO sent details about state of WSDL. Action DO: Report on status of WSDL requirements doc. DC: It's worth it for me to keep a queue open, and look at their spec when it's done. Action IJ: Fix issues list to show that actions/pending are orthogonal to decisions. namespaceDocument-8 : What should a "namespace document" look like? namespaceDocument-8 : PC, TB 2003/01/13: Write up a Working Draft that recommends a data format for namespace docs (not compulsory) and that such a document should follow the Rec track process. The initial content of the document should be taken from the RDDL challenge proposals; they are isomorphic in technical content. Please include drawbacks in the draft. uriMediaType-9 Why does the Web use mime types and not URIs? DC: TAG did a finding; we asked IETF; we had liaison blunders; we did an Internet draft; Mark Baker and I had not addressed some feedback from Larry Masinter. DC: So we updated the appendix. That is issued as an Internet draft. DC: We've not called for discussion on www-tag. DC: There are several paths to take at this point. RF: IANA won't do anything unless it's an RFC. We could make an addendum to the media type registration process, and put through IETF group. DC: I just want to ask for a policy statement that they won't break their Web space. The proposal says that they will give 1 year notice given, etc. RF: Problem is IANA has no leader, and not aware of WG doing work in this area. 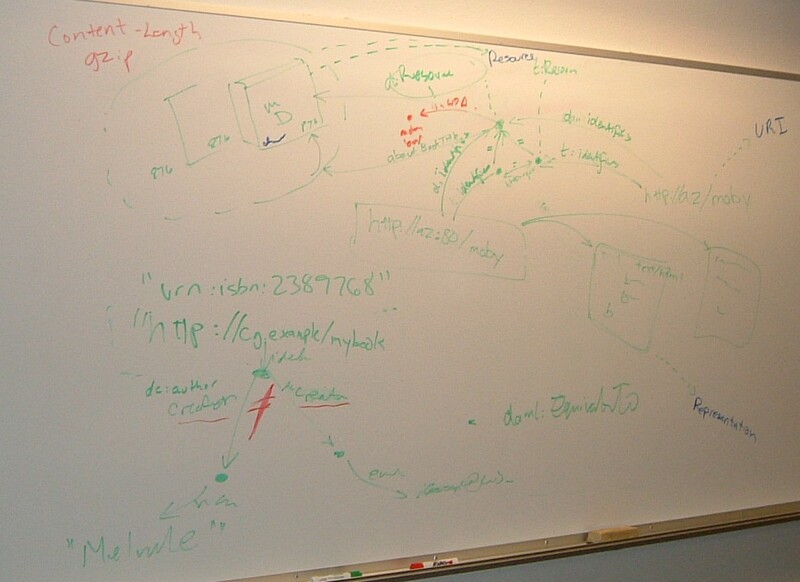 DC: looks like discussion in discuss@apps.ietf.org is critical path. I want to start discussion when I have bandwidth to deal with it. Action DC: Start discussion on discuss@apps.ietf.org, but not urgent. mixedNamespaceMeaning-13 : What is the meaning of a document composed of content in mixed namespaces? The TAG resolved to split this issue into three smaller issues. CL: I've written some text on this. : I think this is an umbrella issue and that we would do well to attack smaller pieces. We already have agreement on subsumed bits. DC: I don't feel obliged to answer it. There is no general purpose solution for how to compose things. TBL: In the area of graphics, I'd like to see schema used to express these constraints. Second problem is, e.g., how do you introduce something like encryption. I think that we need to at least point to questions that need to be addressed by a WG. DC: Please replace 13 with three issues: (1) One issue with mixing some known specs (2) One issue on encryption (3) Maybe RDF in HTML as third issue. CL proposed: "XML functions: Encryption, XSLT, XInclude and other XML transformations"
TBL for second one: "Specifying languages (e.g., encryption, xslt, xinclude) which operate in the context of other arbitrary languages and affect their processing." PC: Is this work for Core? TBL: Perhaps. But I don't like talking about processing model; I like to talk about what things mean. What is common among these things is that they stand for some function of their contents, not their contents. XSLT, etc. have the common property of having to be elaborated first. The effect of intermediate XML processing on namespace semantics? TBL: There is a default processing model (and only one that makes sense). PC: "Transformation and composability (e.g., XSLT, XInclude, Encryption"
SW: I would like to assign an action to get a crisp articulation of the problem before we accept the issue. DO: What is our expected deliverable ? What happens to frag ids in this situation? TBL, DC: That question seems in scope to me. Action TBL: Please crisply state the issue with a reference to XML Core work. Deadline 17 Feb. Proposed: RDFinHTML-35, "Syntax and semantics for embedding RDF in XHTML." DC: I have to address this elsewhere. Ok by me if TAG does not accept. DC Proposed: RDFinHTML-35, "Syntax and semantics for embedding RDF in XHTML." To address, e.g., whether someone is accountable for RDF statements made inside an HTML document. TBL: Is the RDF ignorable in an HTML document? PC: I think that's a good question. I think DC is hypothesizing that nobody is currently answering this question. RF: "RDF semantics in HTML" is the issue then. how is that different from "whether someone is accountable for RDF statements"
Resolved: Accept RDFinHTML-35, "Syntax and semantics for embedding RDF in XHTML." Owner: DC (with low expectations). Proposed: Replace mixedNamespaceMeaning-13, explaining that we identified three subissues (may be others) and that initial issue was deemed to large. Resolved: Replace mixedNamespaceMeaning-13, explaining that we identified three subissues (may be others) and that initial issue was deemed to large. Action SW: Report to www-tag on disposition of this issue. Deadline 13 Feb.
HTTPSubstrate-16 : Should HTTP be used as a substrate protocol? Does W3C agree with RFC 3205? RF: I agree with RFC 3205. Does anyone disagree? Summarizing issue: For each application, use a different port. RF: The RFC is about recommended practice for IETF docs (not whether the battle has already been lost since, e.g., one can do TCP/IP over HTTP...). TBL: Suppose I publish Ical using HTTP. It is very very useful to serve the same data in different contexts, or to have very different data over the same port. RF: Keith is talking about using HTTP for presence protocols, e.g. IPP is an awful protocol; should have been HTTP. IPP doesn't use HTTP (violation or arch principle); uses a POST. CL: If you are getting the status of a printer, use GET. If you are sending data to a printer, use POST. DC: We could phrase a question to the editor (e.g., a SOAP scenario). TBL: I'd like to point out that reuse of HTTP is a good thing. Reuse for many types of clients and data is a good thing. : We could say that we fear that the tone of the document suggests otherwise. If the document is meant to criticize tunneling one protocol over another, then it should say so. See original mail from RF: "After spending another night trying to figure out what we would like to say in regard to RFC 3205, I am ready to declare this as a "waste of time"." TBL: I am dissatisfied with simply sweeping under the rung. RF: Please tell me what to say and I'll send it to them. DC: What's an example of a well-designed Web service? DC: How about SOAP primer example? Action RF: Write a response to IESG asking whether the Web services example in the SOAP 1.2 primer is intended to be excluded from RFC 3205.
errorHandling-20 : What should specifications say about error handling? CL: The QAWG has marked up this issue as "solved"; see their guideline 7 in the QA Framework. PC: But QAWG resolution is about deprecation, not error-handling. DC: Silent failures are evil. CL: Depends on what you define as an error. E.g., is it an error if you have an invalid HTML file? DC: What are you doing with it? CL: Once you've decided you've got an error, you're all set. But deciding is the hard part. PC: I think that this issue was raised essentially in the QAWG and that they've closed it for themselves. We could read their proposed resolution and see whether we agree. CL: Don't fix things silently; people come to rely on a particular type of correction (that's not part of a spec). "I'd like to request that the TAG come up with generalized guidance on the appropriateness of error recovery in web software." It all depends on how you define an error. It relates to composability, and to validation. The person raising the issue is asking for guidance for writers of specifications. DC: Where could we put info from finding on Mime type finding on interpretation in arch doc? PC: This is the conflict between xpath and xquery. Most xquery people want static type-checking. Most xpath 1.0 people want to allow flexibility in what they want xpath to work over. People should at least be conscious of the trade-off. DC: I just want to take a piece of the finding and find a place to put it in the arch doc. Action CL: Write a draft finding (deadline 1 month) on the topic of (1) early/late detection of errors (2) late/early binding (3) robustness (4) definition of errors (5) recovery once error has been signaled. Deadline first week of March. xlinkScope-23 : What is the scope of using XLink? SW: I am confirmed as owner of this issue. DC: Next discussion at tech plenary. SW: Should we reconfirm our position from Sep 2002? contentTypeOverride-24 : Can a specification include rules for overriding HTTP content type parameters? Informative: use of the type attribute should be considered a last resort. For instance, the type may be appropriate when a grammar is fetched via HTTP but (1) a web server cannot be configured to indicate the correct media type, and (2) the grammar processor is unable to automatically detect the media type. From "Speech Recognition Grammar Specification Version 1.0,: section 2.2.2. CL: Some specs have attributes that are advisory only (e.g., likely media type). This seems different; sounds like an override; "don't believe the server." RF: If you were able to do this with an applet, it would be a security hole. But for this particular problem they are trying to solve, may not be. CL: But it may not be a good idea, either. CL: TAG should tell this WG that they shouldn't try to do this sort of thing. DC: I endorse such a comment "don't do this." IJ, noting in section 2.2.2 of same specification: "*the* content type" is problematic. DC: What the server sends back is the authoritative media type. RF: When client expectation is different from media type from server, there should be a user interrupt where the user can override the behavior. It's reasonable to allow the user to override an error; it's unreasonable to override automatically. DC: Another example of silent recovery from error being harmful. Action DC: Send an email to the Voice WG that third para of 2.2.2 CR of Speech Recognition Grammar Spec is wrong regarding override of media type. CL: I will then propose to the TAG to adopt that position. The following minutes are from 7 February. contentPresentation-26 : Separation of semantic and presentational markup, to the extent possible, is architecturally sound. Action CL: Create a draft finding in this space. Deadline 3 March. IRIEverywhere-27 : Should W3C specifications start promoting IRIs? IRIEverywhere-27 : CL 2003/01/27: Send piece that CL/MD/IJ wrote to www-tag. CL: There is movement here; Martin commented on CL / IJ draft. Interrelated with URIEquivalence. Decision there affects IRIEquivalence. I had a proposal, but discussion happening and consensus shifting. Action CL: post document to www-tag, with notation that MD doesn't agree. xmlIDSemantics-32 : How should the problem of identifying ID semantics in XML languages be addressed in the absence of a DTD? TB: I think they are related. If you are solving the ID problem, you need to also decide how to solve the frag id problem. PC: Henry Thompson asks what the TAG wants to happen. They are looking for more details than we have given them. DC: Liam Quin has the ball on this; he has accepted this. binaryXML-30 : Standardize a "binary XML" format? CL: I wrote up stuff for TAG, processing input on it. 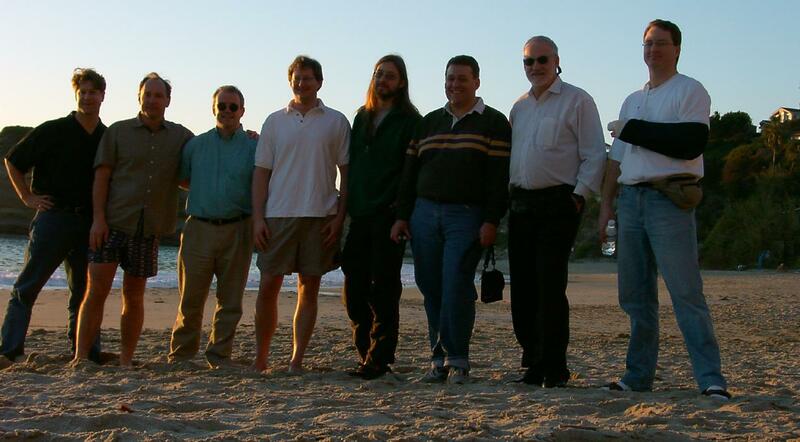 TB: Is there a sense that W3C should do something in this space? CL: There are issues, e.g., streaming (been demonstrated). BIM is patent-encumbered. TB: I am not favorable to W3C doing work in this area. DC: We should publish what we've done. Action CL: Write up this work on binary XML. metadataInURI-31 : Should metadata (e.g., versioning information) be encoded in URIs? Action SW: Draft finding for this one. deepLinking-25 : What to say in defense of principle that deep linking is not an illegal act? DC: I have some questions on how to compare URIs. I want to tell people that if they use strcmp that they can get the right answer. Action TB: Send URI equiv draft finding to uri@w3.org. Resolved: Accept Tim Bray's draft finding on deep linking. Action IJ: Publish Deep Linking finding as accepted finding. URIEquivalence-15 : When are two URI variants considered equivalent? TBL 2003/01/20: Send email to uri@w3.org requesting terminology change (regarding definition of "URI"). Dan Connolly did a slide presentation on some issues related to URI comparison. TBL: We should say here "Don't do this!" ; there's a high cost to reserved names here. TB: robots.txt has problems; could have been done lots better. I should take several things from DC's slides and give a different takeaway message to thefinding on URI Equivalence. DC should dress up your slides and publish it as a service to the world. Action DC: Publish slides on URI Equivalence. TBL (on robots.txt): If this is bad, should we invest time into asking some group to do it properly. A generic hook for putting site metadata on a header. RF: It's a design trade-off. Latency with every GET, or reserved space to look for information. Action TBL: Write up a proposal for a new issue regarding generic metadata hooks (related to robots.txt). CL 2002/09/25: Redraft section 3 based on resolutions of 18 Nov 2002 ftf meeting. DO 2003/01/27: Please send writings on Web services to tag@w3.org. DO grants DC license to cut and paste and put into DC writing. CL 2003/01/27: Draft language for arch doc that takes language from Internet media type registration, propose for arch doc, include sentiment of TB's second sentence from CP10. Reference draft is 12 December 2002 Editor's draft, but we also discussed 6 Feb 2003 Editor's Draft with changes from CL. SW: I like the structure of the document; but I don't think this document tells me what the architecture of the Web is. Could talk more about people building on top of the platform that is the Web. I'd like a conceptual model to be presented up front. We get into good practice without establishing the model . I'd like the doc to be as short as possible, with links out to more info. TBL: The style of the doc is close to what I think is reasonable. We spend a lot of time talking about nuggets, but have as a goal to produce an all-encompassing work. We should allow ourselves to produce a document that is uneven. I think that we should assume that the reader knows a fair amount about the Web. We should use terms consistently, but we needn't be overly formal. If we want to be formal, doing a mathematical ontology would be unbelievably useful, but I see that as something separate. The document is morphing slowly; I don't know when to read it. HTTPRange-14 has become a discussion between me and Roy. I think that if we come up with a consistent story, people will probably go along with that. RF: I think we need to ensure that we are using the terms consistently. TB: I think I would like the doc to be thin and consist of bald statements ("this is the way it is") with examples in the document. Whenever you need historical exegesis, good place for a finding. Still need to clear up principle v. constraint v. choice. Need to clean up or throw out. Pace has been unsatisfactory over last 4 months. I'm unlikely to use CVS; Happy to use Ian as a single point of editing. CL: I'm getting more comfortable since I've started editing. PC: I don't have many concerns right now. What is public perception of the document? TB: We haven't had much feedback. PC: I don't know whether we're doing enough to get people to comment on this document. Do we really expect to go to last call in 5 months? We have to have real targets about what we want in the document at last call .For last call, this document has to describe the Web as it is today. I'm not convinced we have to describe the Web of the future in v 1.0. TBL: We need to make clear in status of this document that we don't expect to be done in v 1.0. PC: We need to agree to the scope of v 1.0. CL: We need to make clear whether we are following, e.g., the Process Doc model or model of a technical spec. RF: I'd like to add more scenarios and more background. I think we need to do a better job explaining the framework. I can deal with people using different terms; but not happy with people using same terms differently. I would prefer to have an agreed upon TAG / attribute mechanism so I can edit in place. Action IJ: Explain how TAG participants can edit the source of the arch document. DO: To me, a lot of things are missing about the Web architecture. We don't say what we mean by an architecture. There are things like data, connectors, etc. in RF's thesis. Those are useful; I'd like to be able to relate WSA to Web Arch via this framework. E.g., definition of "agent" used in arch doc caused criticism of term in WSA community. PC to DO: Should arch doc be limited to Web today or Web with Web services? DO: Let's discuss later. We need treatment in other areas than URIs. E.g., architecture of XML. DC: I'm invested in arch doc up to 2.1. Swimming in rest of 2. Not much opinion of rest of doc. Process has been sort of ok for me. I don't understand why there are pent up comments; people should send text. On the challenge of brevity v. understandability; I see that what we are doing is having some effect. Probably ok with terse prose and elaboration elsewhere. In many cases, I find that rationale is economic, not logical. That's ok. There are a few cases where the principle is something I agree with, but not expressed exactly correctly .Often problematic in quantifiers. I owe text on this. Diagrams would be nice. I'd like to see more discussion of the text that we've got. RF: I'd like to get all of us writing into the document. Fine to have 10x the text, and then reduce it from there. RF: I have affinity for the section on interactions, but not as it stands. RF: I note that Content-Length is implemented inconsistently in user agents. TBL: Web Architecture doesn't tell you whether two resources are the same. Difference between URI-equivalence and HTTP-equivalence. TB: Both DC and TBL are right. We know that moby and moby.html are quite possibly the same thing in real life. But the Web arch doesn't have the notion of "same in real life" built in. TB: We need to ack the fact that (1) this occurs in real life but that (2) just by looking at the URI there's no way to tell. DC: I don't agree to TBL's constraint that only one URI identifies a resource and no way to talk about URI-equivalence. TB: Web arch doesn't have a built-in relationship "isEquivalentTo" that applies to multiple URIs. TBL: We agree on URIs (as set of bits) and Representations (as set of bits) since we have machines that can work on them. We don't have agreement in the abstract realm (Resources). You can't claim that "resource" is a shared term. DC: To me, the URI spec is a worldwide agreement for a convention for making up identifiers and how they take on meaning through use. You share your understanding of their meaning by servicing GET requests. TBL: My expectation is for consistent information about a resource from one representation to the next. What keeps the Web working is that the form of identity is that representations for a resource continue to convey the same information. PC: I think DC's original diagram should be included in arch doc. I still haven't heard pros and cons of TBL's model v. DC's model. TBL: Problem with DC model is that when you have a URI for a real book, you can get two inconsistent DC:Creator assertions for the same URI (either email address of person who created page about the book v. Herman Melville). TBL: Following the specs can lead to an inconsistency. DC: I think an arch doc that addresses knowledge representation is a valuable asset; I would like to spend my time there. DO: I'd prefer to not reopen this issue. PC: I'd rather not reopen. PC: The second diagram may be a refinement of the first diagram (DC's) but we can do that later. TBL: I'm not trying to go down path of KR, just trying to use terms precisely. Without getting the diagram nailed down, we will not have a precise definition of these terms. RF: WSA does need to verify that HTTP URIs don't always refer to documents. Resolved to reopen issue HTTPRange-14. RF: I don't think we will have a document in July unless we resolve this issue. TBL: I have a hard time contributing to the document without clear term usage. SW: I think we have to agree to a foundation model and put it up front in document. SW: Does CR period make sense? I think we should see, e.g., whether we help two WGs get to Rec.
" 1. An Internet Media Type, which may include optional or mandatory parameters"
TB: I disagree with this. There are other parameters. Does Internet media type include charset, etc.? DC: I'd feel better with citation of the relevant spec. RF: The whole first paragraph is bogus. TB: Do we consider that representation includes just data, or just media type header, or all headers....? negotiation, as described in section 12. There may exist multiple representations associated with a particular response status." RF: Representation is data and metadata. TB: Representation = body + one or more headers that are included in the message response (but not part of body). TBL: Mime type is particularly important since determines how to interpret bag of bits. CL: Slicing half of the headers as being in or out of the representation is a pain. DC: That's part of life as we know it. "Not modified' means previous representation not modified. But the transfer metadata can change. TB: I think I agree with CL. From the perspective of agents, I have access to all headers and status. In principle and practice, this is information that is available to the agent. It doesn't seem to me to be harmful to dispatch processing based on, e.g., transfer encoding. Furthermore, other headers will be invented. I propose that we assert that the representation is data + all metadata. DO: I would like to distinguish message from representation in the arch doc. RF: Representation defined this way so that it has the same meaning in both PUT and POST situations. You don't create messages on a server; you create representations. RF: We know that that it was a mistake in HTTP to not be able to distinguish msg metadata from representation data. We would fix that in the next protocol spec. RF proposal: Resource rep consists of metadata about the representation and data for the representation. DO: We need to talk about msgs in the arch doc. message consists of message metadata and representation. where is "representation data" used, Roy? PC: I'd like to have a diagram, reuse existing definitions, link to authoritative specs that define these terms. RF: "representation data" comes from Roy's PhD. I asked whether we intend to import "body" from the MIME spec (RFC 2045) ; the question went unanswered. Lilley said he had sufficient advice on the matter to produce another draft. Nothing was decided. RF: Application-independent at the parser level. PC: namespaces w/o schemas help define parts of xml doc. PC: When you add schemas, you get a more powerful definition language. CL: I try to present things as a continuum. TBL: I like "presentation", I don't like abstract/concrete. tim wants me to avoid the term semantics here - great! CL: Need to clarify use of term "interaction": network interaction or human-computer interaction. TB: "Protocol" is heavily overloaded. Tim Bray comments refer to 12 December 2002 Editor's draft. IJ: I find three distinctions useful: best practice, design choices, and axioms ("it is this way"). It's one thing to design the doc with these things explicitly in mind; another to label them explicitly. TB: I'm not convinced that it's valuable to create a taxonomy and label things in the document according to this taxonomy. RF: Useful to distinguish goal, way to get to that goal, and a property established by making that decision. Allows other communities to see that, by relaxing a particular constraint, they may lose a particular goal. TBL: I don't find property/goal distinction useful. RF: Constraint is "The only identifiers in the Web are URIs." But arch doc is not expressed that way. TB: however, it's useful to instruct in terms of best practice. i.e., "if you're pointing from one thing to another, use URIs". Yes, that's a constraint. TB proposal: Delete "Fortunately... " .to end of 2.1.1. CL: There are examples there. TB: Add an example to the second paragraph to illustrate that point. Proposal: Make third bullet third para and delete the rest. TB: The point is that people want to determine that two resources are the same; not currently part of Web arch; people are working on this. TBL: I'd like to see the various levels of equivalence stated more clearly. Please say that you can't tell that two resources different; but that in some situations you can tell that they are the same. TB: I think that's covered elsewhere. TBL: The URI draft should not talk about HTTP equivalence. Move some of DanC's slides to this section (or elsewhere). 1. If you mean the same thing, say it the same way. TB: Propose to shorten this and reference finding. 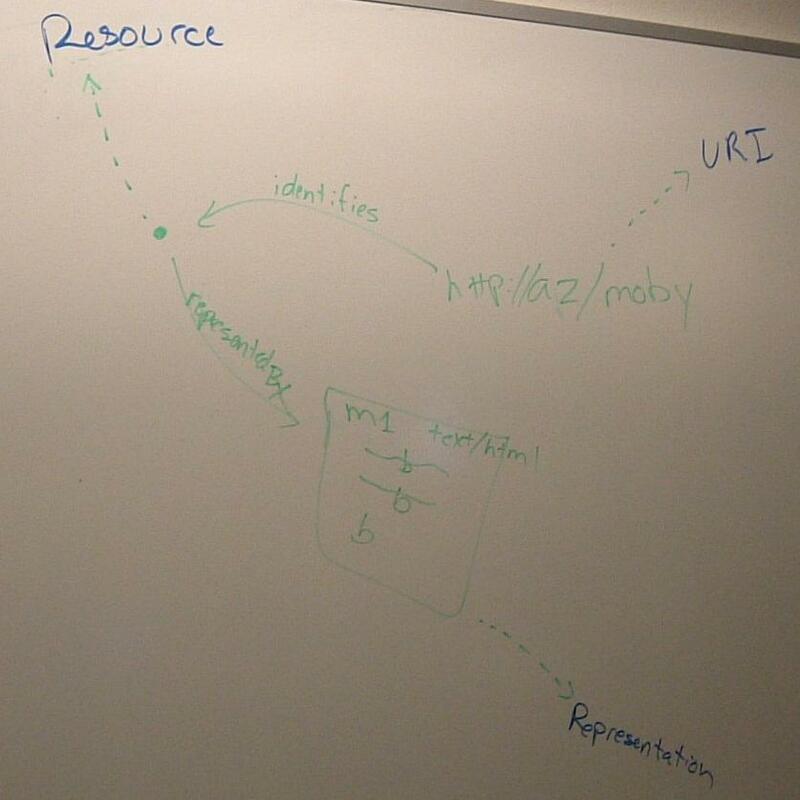 Proposed at beginning of 2.2: "URIs exist to identify resources. The two operations that can be performed on them are to compare them and to dereference them." RF: Doesn't google use them for other things? What about "establish relationships"? changing "The two primary" to "Two primary..." would do it for me. IJ: Primary operations may depend on who is doing what. For author, "create links". For spec writer, "Define data type", etc. 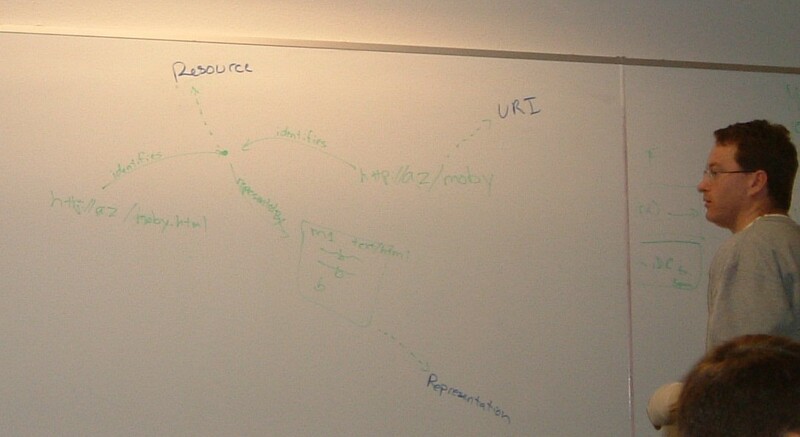 : These are also operations on URIs that are about Web arch. IJ: What if we recast this section as "The good thing about the Web is that there are (at least) two useful things that you can do on a URI..." I'll take a whack at this (to try to make this less constraining). TB: Delete first para of "2.2.4. Consistent representations"
DC: The para means to say "Whatever you get back from the HTTP Server is 'correct'" The world has agreed that what you get back is a valid representation. TB: Is there such a thing as an invalid representation? IJ: I think we are missing a clear statement of where were are trying to get by the end of section 2. Why are we talking so much about meaning/equivalence/identity? What is the value/importance of being able to say that two resources are the same, or that the meaning of the resource is such and such?